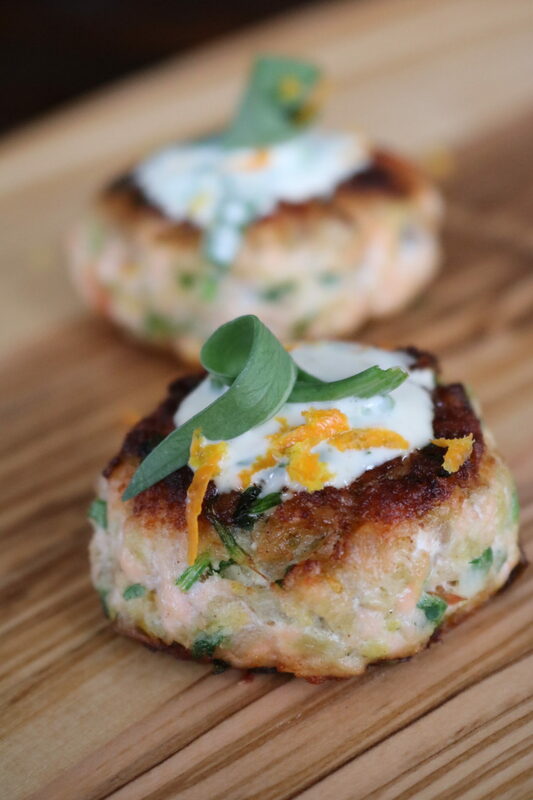 “Cake, cake, cake, I know you wanna bite this.” And because they’re salmon and mini – hence Mini Salmon Cakes with Citrus Tarragon Tartar Sauce, you can have as many as you want girl. Add mayonnaise, orange zest, tarragon, lemon zest, shallot, Dijon, lemon juice, and orange juice to a small mixing bowl and whisk until combined. Refrigerate until ready for use. 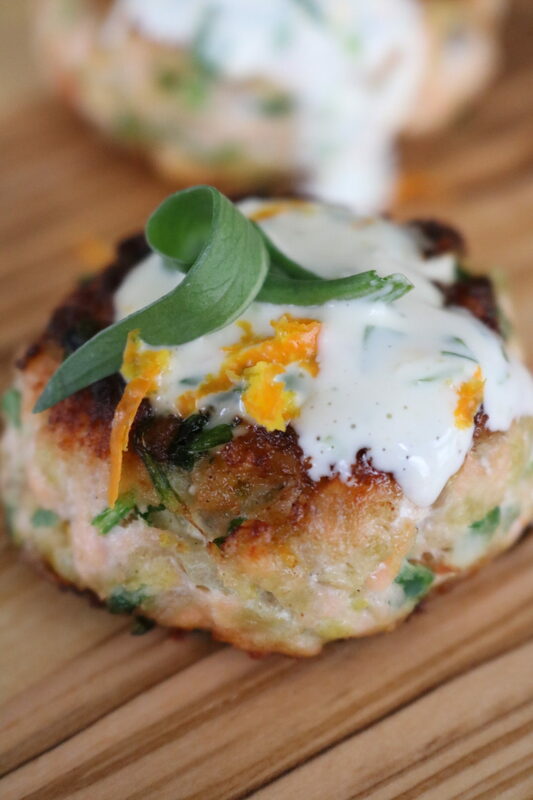 Remove skin from salmon and pulse in food processor for 30-60 seconds until similar to the consistency of ground meat. Transfer to a large mixing bowl and add mayonnaise, parsley, salt, lemon zest, orange zest, shallot, poblano pepper, and Panko. Fold until thoroughly mixed and form into bite sized cakes- sprinkle with additional salt. Preheat oven to 200 degrees. Heat large cast iron pan to medium with a 1 tbsp avocado oil and fry in batches until golden brown on each side and thoroughly cooked (3-4 minutes on each side depending on thickness). Transfer cooked cakes to a sheet pan in oven while continuing to fry. 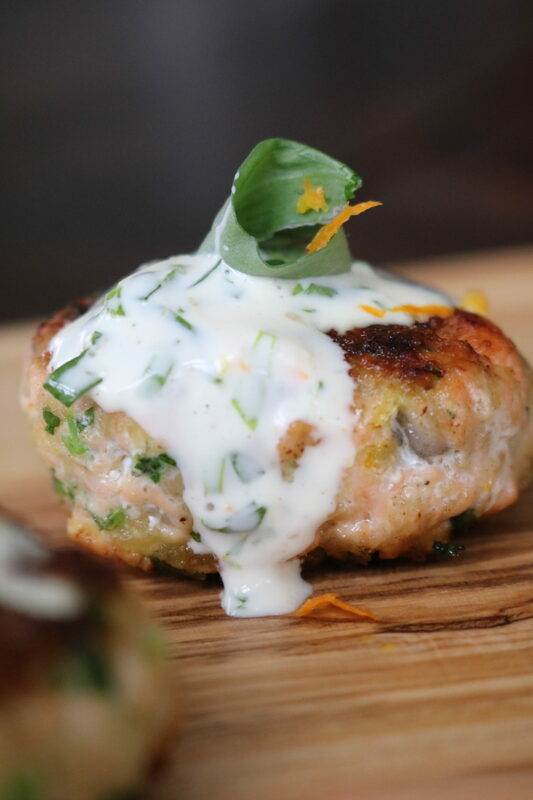 Serve warm with a dollop of citrus tarragon tartar sauce and garnish with additional tarragon and zest. Enjoy!